There are mainly three types of Roofing Materials commonly used for flat roofs. The three types of roofing materials are EPDM Rubber, TPO Vinyl, and Modified Bitumen Torch Down. 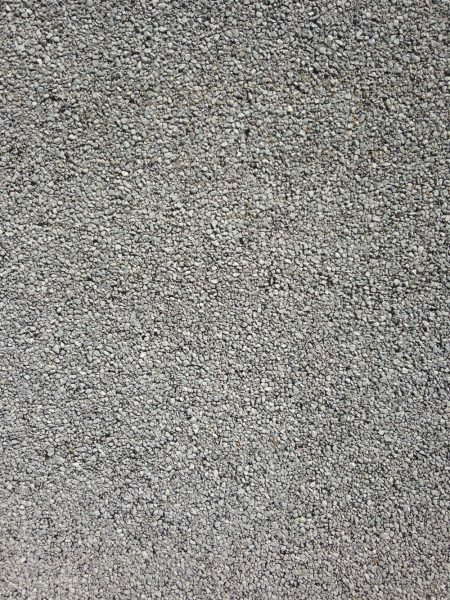 These materials classified as “single ply” roofing membranes. Every roofing system has its pro’s and cons and techniques of installation. Modified BitumenTorch Down is by far the most durable roofing material. Once a single ply torch down is coupled with a second layer Modified Bitumen Membrane, it becomes a Two Ply System that surpasses the quality and standards of all other roofing systems. Comparing EPDM Rubber Materials with Modified Bitumen Torch Down Materials. The article on Rubber Roofs will explain the experience we have had over the last 30 years with rubber roof materials. One of the main reasons why one roofing material is better than the other is that one can be protected and the other cannot be protected against Ultraviolet Rays. If it wasn’t for Ultraviolet Rays, then any roofing material would be suitable. The only material that UltraViolet does not have an effect on is “stone” or “ceramic”. By adding a ceramic layer on the top surface of a rubber membrane, will protect it and extend its life. EPDM Rubber Roofing Material Single Ply with no ultraviolet protection. Seams a glued together and the adhesives brakes down in extensive heat exposure. The biggest problem with EPDM Rubber Roofing Material is that the adhesives that are used to glue the seams together. The adhesive used is a contact cement and over the last 40 years have been recalled over five times. The extreme heat on a flat roof, over 160 degrees F, breaks down the bonding properties of the adhesives and compromises the roof. EPDM is also a thin material that can easily damage by workers around air conditioners and other objects on the roof. The maximum life expectancy for an EPDM roof without maintenance problems is between 10 – 15 years. Firestone manufactures EPDM Rubber Material. Although EPDM Rubber was never intended to be used for commercial roofs, it slowly made its way in and today we see over 50% of commercial roofs covered with EPDM Rubber materials. 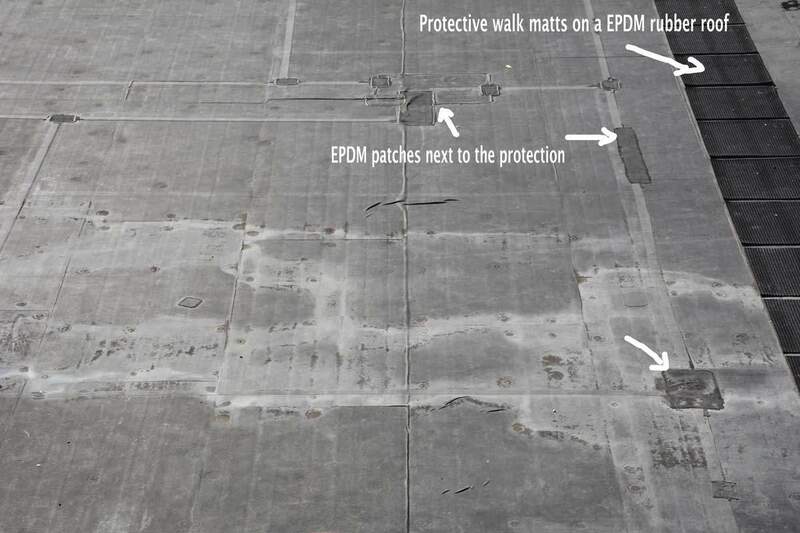 The image above shows walking mats to protect the EPDM material but yet there are patches all over the roof. Protective mats are never walked on. The reason for all the patches is because of the intense heat and the black membrane absorbing most of the heat breaking down the adhesives bonding the seams. After 60 years there is no solution to this problem yet. 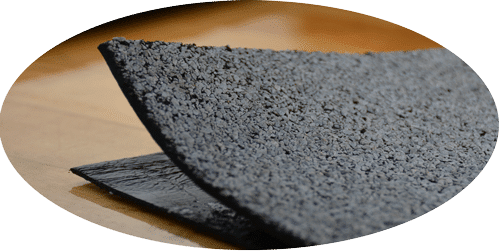 Why is Modified Bitumen Rubber Materials better than EPDM rubber? Heat welding versus glue – The glue that bonds the EPDM rubber at the seams is affected by heat and the sun and deteriorates over time. Modified Bitumen will last longer without maintenance than all the other roofing systems. EPDM and TPO has a big shrinkage problem over time. That is what will pull away from the wall and flashing. Not so much with MB. A roof gets abused by Maintenance people – air conditioning, cleaners and snow removal people. Modified Bitumen Rubber can withstand most of these abuses. The MB rubber is tougher and can withstand snow shovels better than the EPDM or TPO membranes. Modified Bitumen rubber life expectancy is far greater than EPDM or TPO membranes without trouble. Notice the white rubber membrane. This rubber material comes with ceramic granules embedded protecting the rubber against ultraviolet and causing less heat to be absorbed. This type of rubber roof is very sturdy and durable. 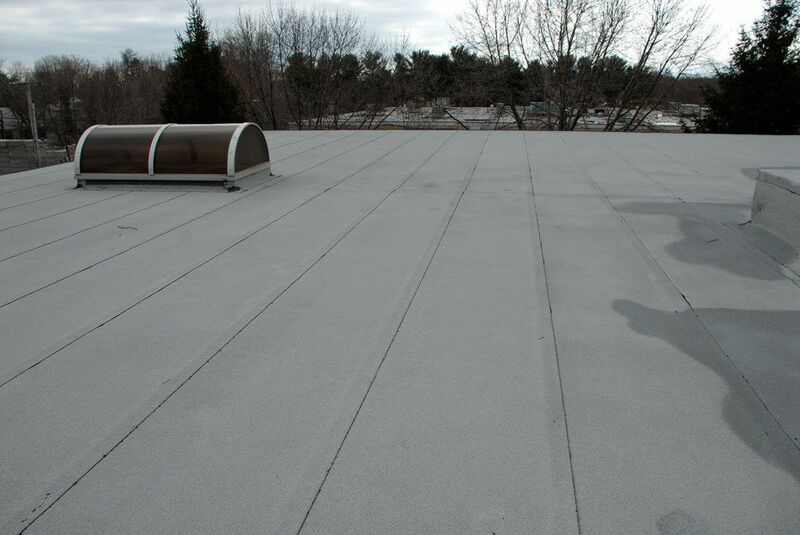 When it comes to commercial roofs, then this is the choice material because it is expected to have service and maintenance people on it regularly. If they happen to drop nails and screws, it will not be a problem if someone would step on it unlike on an EPDM rubber roof. Installing Modified Bitumen rubber roofs is pretty straightforward. There are techniques as in any roofing material that should be followed to ensure a stable roof over many years. The problem is that many roofing companies have stuck to EPDM rubber and never got familiar with Modified Bitumen rubber roofs. Installing a Modified Bitumen rubber roof is also less costly than EPDM. It is more robust and thicker than EPDM and installs over almost any surface, unlike EPDM rubber roofs. As long as the flashing is exposed and free from debris, you can install the modified bitumen membrane straight onto an existing roofing material. The image above is of a Torch Down over 20 years old and shows no sign of deterioration. This is the best roofing material that could be installed on a flat roof. This video shows how ultraviolet rays can break roofing material down. All types of roofing materials are prone to degradation if not protected. EPDM Rubber and TPO Vinyl materials do not come with ultraviolet protection regardless of the claims that it is built in. Modified Bitumen Membranes can come with protection or without protection. When a roofing contractor installs a Torch Down Rubber material without the granules. them it is important to have it coated with Silver Paint or Aluminum Asphalt paint. The extreme heat on a flat roof, over 160 degrees F, breaks down the bondingproperties and compromises the roof. Liquid EPDM rubberis not damaged by Ultraviolets, water heat or other problems over time. You are correct, that the “extreme heat” is what breaks down the bonding properties. But, the ultraviolets also cause the EPDM Rubber to lose its elasticity. I have videos on my site where you will notice how the material shrunk and was putting stress on the seams and the wall transition. Thank you for correcting me. The Ultraviolet was not the cause of the Adhesive failure but rather the heat. Good catch. Why do most roofing contractors choose to install EPDM Rubber than the TPO or Torch Down? 1. It is a very thin material and therefore the rolls can be as wide as twenty feet. Installing materials from eight feet to 20 feet wide makes for fewer seams. 2. EPDM requires minimum tools. Because of a glue down process, all you need is a utility knife, paint brush, rollers, and scissors to be able to install EPDM Rubber on a prepared surface. 3. Requires little skill – you can train someone in a few hours to be able to install this type of rubber membrane. 4. 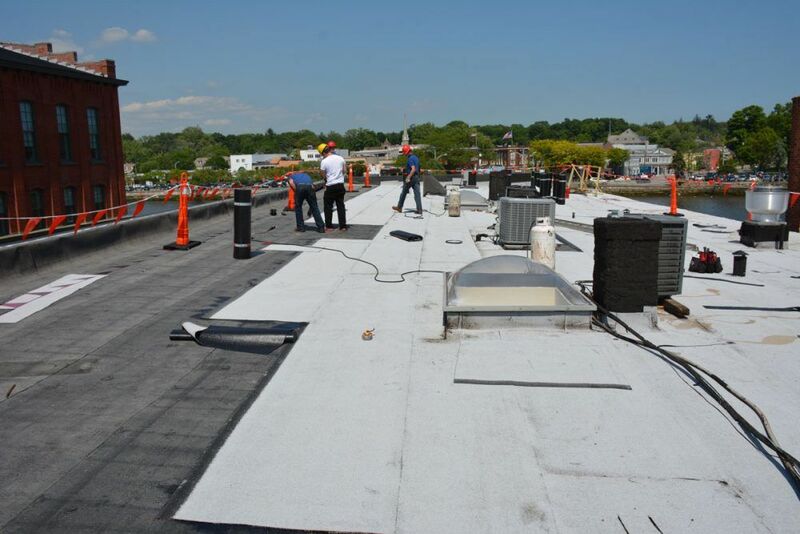 EPDM Rubber is quicker to install and is less labor intensive, that alone is a huge saving to the roofing contractor. 5. A crew of two people can do an entire roof. There are several reasons why roofing contractors don’t install TPO or Torch Down Rubber membranes. 1. It takes an experienced person to be able to handle a torch or heat welder for TPO. There are not many around. 2. It takes longer to install these membranes. 3. The equipment is more expensive. In the case of a TPO Membrane, the equipment and tools will run over $12,000 before you can start installing it. 4. Torch Down comes in three foot wide rolls, and therefore there are more seams on the roof. The reason why it is only three foot wide is that the membrane is four times thicker than that of TPO or EPDM. 5. To keep an experienced crew around that installs TPO or Torch Down, becomes expensive. I hope these points cleared up the questions you had.